This is my fourth post on organizing a creative space for my kids. You can see the mess I started with in my first post on organizing a kids’ craft area, as well as my process of organizing craft supplies and creating a fun and functional kids’ creative space! Great news! I was super inspired to finish organizing my kids’ craft bar last weekend, which really just involved some minor tweaks and making labels. I had been hung up on making the most perfect labels, but then I realized that was a silly roadblock. If I put labels on and didn’t love them, they could be changed right? I wasn’t applying them with epoxy or anything! So, I pulled up these cute, free labels from Better Homes and Gardens and got to work. I hesitated to use these because I wanted labels in the perfect shade of red, but I also wanted to get this step completed over the weekend. So, in the interest of moving forward, I used these that I had pinned a long time ago. It turns out that I love the colors and am glad they aren’t red after all. I used a combination of round and rectangular labels in various sizes, and the colors are blue, orange and green. They all feature consistent font and design elements. I think they look cohesive, but the variations keep it fun. 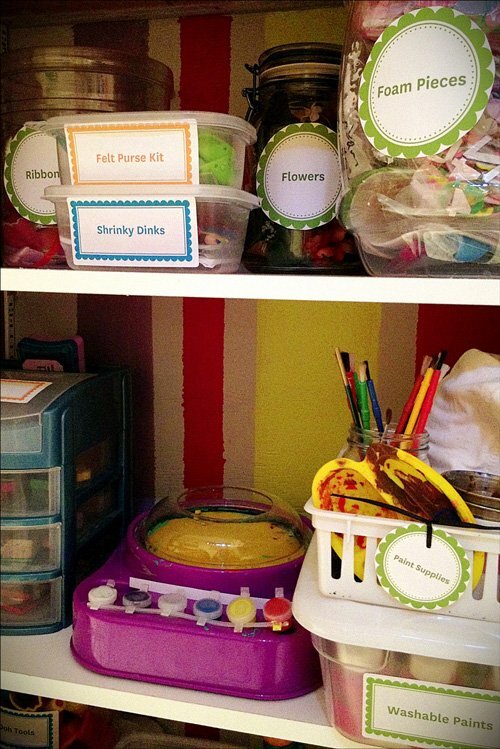 Aside from being cute and fun, labels really help to unify the look of the space. 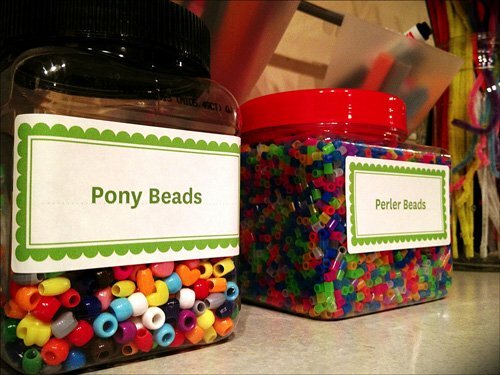 But more importantly, labels help make the space more functional and organized. It’s much easier for the girls to find what they’re looking for at craft time, and it’s also easier for them to clean up because it’s clear where everything goes. I’m really happy to tell you the organizing portion of this project is officially complete. Yay! My kiddos love this space, and I love how it’s working for us. My 7-year-old, Faith, crafted a lovely birthday card for her grandma this week. She had a lot of fun using various tools and supplies to make it. When I went to the craft bar later that evening, I seriously couldn’t tell anyone had done any projects at all. Every single thing was back in its place. Woohoo! It really feels great to have this space freshly organized. How do you feel when you cross the finish line on an organizing project? Love the paper tray set-up. 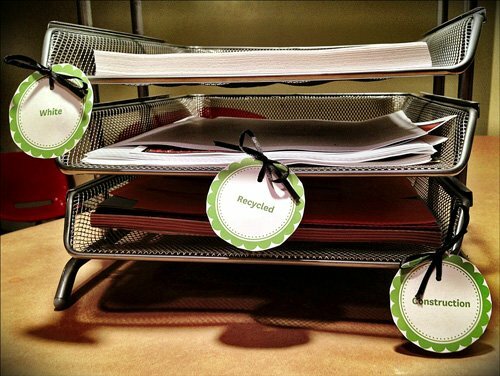 It makes the recycled paper more appealing than fishing it out from the recycling bin! Thanks, Emily! We have always used the backside of paper for things, but my girls would get so irritated when they couldn’t find a truly blank sheet that they started to balk at the recycled papers. This solution really helps us out. This makes me so excited to throw together a craft area for the girls when they’re a little older. Right now they’re 17 months and 2, so they’re just starting to get into craft play. Thank you, Venassa! Aw, I remember well when our craft supplies were kept up out of reach. The days of the big round crayons seem to go so fast… enjoy!